Case Study - Livity — Wellkerned. Earlier this year, we were asked to create a new identity for highly-esteemed agency, Livity. The work that Livity does, both in output and practice is inspiring, so it was an honour to lead their rebrand, draw a new logo and create a set of brand guidelines for them. 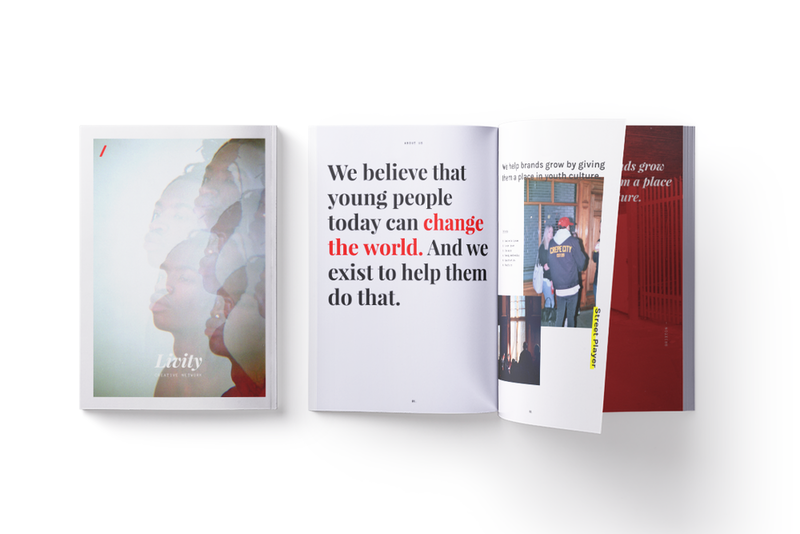 The brief we created with James Hogwood, Livity's Creative Director, was simple - to create a fluid and future-proof visual identity that confidently reflected the unique new direction Livity had taken as a youth-led creative network. Our solution was to develop a truly disruptive aesthetic for Livity, with a system that would be flexible enough to house trends and cultural shifts as they emerge, yet distinct enough to always be recognisable by characteristics such as shape, colour and typeface. > Below, insight into the design process of Livity's noisy but truthful identity, with extracts from the Brand Guidelines that we created, direction on typography, colour, texture, photography, illustration amongst others. As part of brand guidelines that would hold true to both the eco-system and youthful spirit of Livity, we created a logo, progressive in its forward-leaning shape and dynamic in its function of housing content. One that would act as a rotating window to showcase the impressive depth of commissioned photography from the young creatives in Livity’s network. With 'authenticity' a key attribute of Livity's core DNA, it was paramount that the new logo we created acted more as a framework to support the art rather than overpower it. To compliment the mark, we designed a bespoke industrial sans-serif logotype and balanced it with a romantic yet playful serif font that payed respect to the brand's heritage and its Brixton roots. A simple formula was then devised for all content and collateral to ensure consistency within all output. Key components being a vibrant colour palette, a range of textures taken from Livity's home and two dedicated headline typefaces. Alongside this, we created new tone of voice, photography and illustration guidelines with an emphasis on youthful sincerity, thus encouraging a more truthful and unfiltered approach in all areas from subject matter to treatment. The end result was a bold and positively disruptive look for Livity that truly embodied the noisy and contagious spirit of modern day British youth. True to their ethos, the identity symbolises optimism and hope, whilst maintaining a sense of relevance, thanks to its open system. With its unique visual language, we also achieved our secondary objective of helping differentiate Livity from the rest of the market; presenting Livity as the authoritative, progressive and relevant voice on British youth culture. Winner of the 2017 BIMA Grand Prix Award and Advance Award for Entrepreneurial Business of the Year.